Bay World Manufacturing is the Original Projection Window Frame Manufacturer. Our company partners with many of the leading window manufacturers in the industry. Our core Cabinet Style Frame Systems were an industry first of its kind. Unique in design, our cabinet style frames will accommodate any replacement window, sash insert or even direct-set insulated glass. Bay World was also the first to feature Timberstrand Laminated Structural Lumber® in its’ vertical mullion and angled side jamb components. The unique and superior design is still featured in all of our hardwood veneer and solid-hardwood cabinet style frame systems. The frame design provides unsurpassed strength, support and warmth, as well as added beauty to the interior of each handcrafted projection window. The final assembly is completed with the installation of the windows into each opening of the bay/bow frame. This provides the ability to combine virtually any window style. 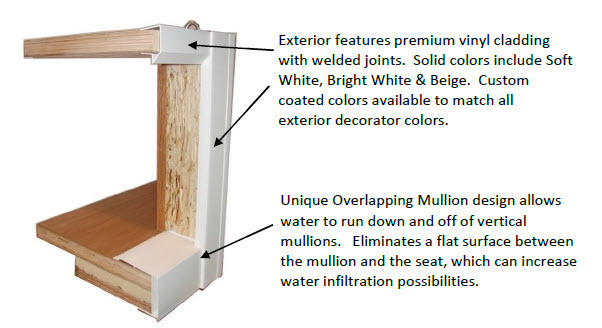 The assembly process can be completed either in the manufacturing plant or on the actual job-site after the frame has been installed into the opening in the house wall. Completing the installation of the windows in a plant setting provides a higher level of controlling the quality of the window installation process. Installing the windows on the job-site drastically reduces the weight of the frame and enables the installation process to typically be completed with less workers. Many of the window manufacturers we serve offer their projection windows with both options. *Bay & Bow Frames are available in custom degree styles to meet the most difficult job site requirements. Solid Hardwood Frame System features Red Oak and Maple hardwood interior. 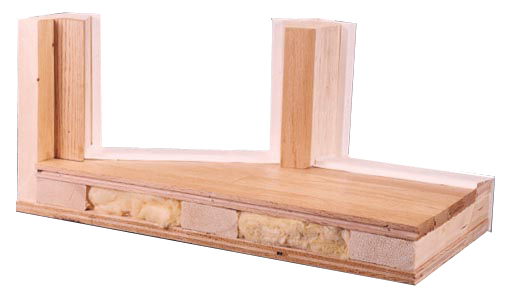 Head & Seat components simulate an insulated studded house wall. Interior surfaces are completed with ¾” solid hardwood tongue & groove hardwood floor. 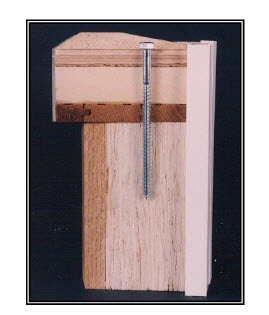 The flooring is attached to 2 x 4 Timberstrand LVL Structural ribs that are attached to ¾” Exterior Grade Plywood. The 1 ½” spaces in between the structural ribs are filled with High-Density Fiberglass Insulation and the 3” thick insulated head and seat yield an R 9 Insulating Value. An Optional R18 & R30 High-Density Foam Package is available and would attach under the 3” Insulated Seat Component. 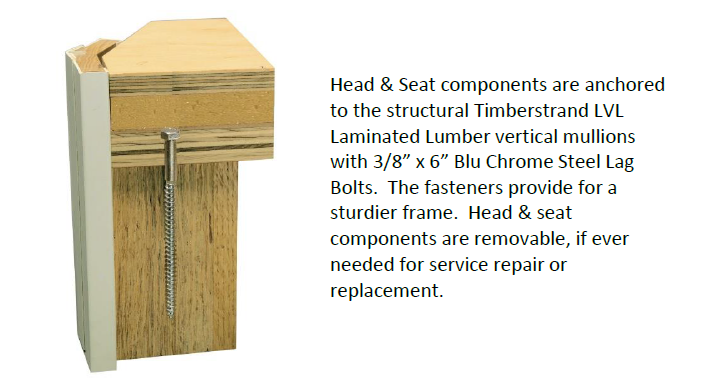 Head & Seat components are anchored to the structural Timberstrand LVL Laminated Lumber vertical mullions with 3/8” x 6” Blu Chrome Steel Lag Bolts. The fasteners provide for an ultra-sturdy frame as well as enabling the head & seat components to be removable, if ever needed for service repair or replacement.